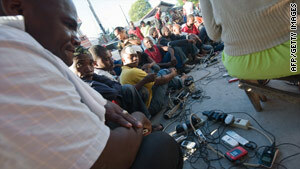 When cell phone coverage and Internet failed, some Haitians turned to amateur radio to communicate. A Haitian man says amateur radio helped him contact family in the U.S.
(CNN) -- In the brutal aftermath of Haiti's earthquake, Jean-Robert Gaillard turned to his low-tech radio for solace and for a lifeline. When the earthquake hit, the 57-year-old from Petionville, Haiti, found most of his normal lines of communication -- his cell phone, the Internet, even his ability to walk down the street and talk to someone -- severed by the disaster. But Gaillard used a neighbor's generator to power up his radio and connect to a handful of amateur radio enthusiasts in the United States -- many of whom were eagerly listening to radio static for calls like his. Unlike many other people in Haiti, Gaillard was able to contact family members in the United States soon after the January 12 earthquake hit to tell them he had survived. In those first hellish moments, that connection seemed like a miracle. "It relieved the tension of my family members," he said, speaking by Skype from Haiti on Tuesday, which he says wasn't possible until more recently. "They could hear my voice. They knew that I was OK."
Much has been made about the role flashier technologies like Twitter, Skype and text messaging have played in helping disaster victims find loved ones and communicate with international aid workers. But it is worth noting that, when all else fails, the low-tech hum of a radio frequency is sometimes the only line of communication that's open. Enthusiasts of amateur radio -- or ham radio -- are quick to use this as evidence that international aid groups and governments should rely more heavily on radio in disaster situations. Ham radio signals bounce off of a layer of charged particles in Earth's atmosphere, called the ionosphere, and, depending on the conditions, can work at times when other modes of communication fail. But amateur radio is best viewed as one of many communications options in the wake of a disaster, said Keith Robertory, manager of disaster services technology at the American Red Cross, who has been helping in Haiti relief efforts from Washington. The best communication technology in a disaster, he said, is whatever happens to work at the time. "Amateur radio is a very powerful tool if the amateur radio operators are in the area where the disaster occurs," he said. "There's a window of opportunity for amateur radio operators right at the beginning [of a disaster]. ... That's where they are extremely valuable." Because that window has now passed, cell phone connections, text messages, Twitter posts and Skype calls are becoming more significant, he said. A 23-year-old woman, for example, was rescued in Haiti after text messages were sent from beneath the rubble of a school building. Radio stations in Port-au-Prince, the Haitian capital, have been broadcasting almost since the earthquake, providing the only means of communication for some people, Agence France-Presse reports. Some mobile phone towers in Haiti fell during the earthquake, and cell phone service was not returned to much of the country until at least two days after the tremors first shook the poor Caribbean nation, according to a mobile phone company operating in Haiti. About a third of people in Haiti have access to mobile phones, compared to nearly 90 percent of people in the United States. Reports suggest Internet connections also were spotty in the earthquake's aftermath; and only about 11 percent of Haitians have access to the Web in non-disaster situations, according to the CIA World Factbook. Aid groups and journalists have relied on satellite phones, which work independently from local Internet and mobile phone infrastructure as long as the sky isn't too cloudy. Such technology isn't commonly available for disaster victims, however. Carol Wilson, compliance director for Trilogy International Partners, which provides mobile phone service to about 1 million people in Haiti, said 80 percent of the company's cell towers in Haiti were working as of Tuesday. The company is donating out $5 worth of free phone calls to its customers and is giving people double the amount of minutes they would normally get so they can catch up with loved ones and communicate with aid groups, she said. The main problem with mobile phone connections now, she said, may be fuel, since generators are used to power most cellular towers in Haiti. In the immediate wake of the disaster, before cell phone coverage was restored, William F. Sturridge, a ham radio operator in Flagler Beach, Florida, said he was able to connect a priest living on the remote Haitian village of Ile-a-Vache with his family members in the United States. On Wednesday morning, the day after the earthquake hit, he said he heard a faint call of "hotel, hotel," which signifies the "HH" letters at the beginning of radio call signs in Haiti. He responded immediately. "When other systems don't work, [radio] always works," he said. "It doesn't matter -- no matter where you are in the world ... you can get a [high-frequency] signal out and somebody will hear." After connecting with the priest in Haiti, Sturridge said he called the man's brother to tell him his sibling had survived the earthquake. "He was super worried," he said. "They hadn't heard from him, and it was wonderful to be able to pass the information and hear the relief in the voice." Sturridge said he's been listening for radio calls from Haiti almost non-stop, with no sleep, since the earthquake hit a week ago. The 51-year-old is disabled, and he said the radio gives him a lifeline to the outside world as well. "It's very difficult for someone who is bed-bound to be able to work and be able to enjoy the benefits of helping other people, so this is one way I can do this very easily," he said. "Certainly, I can't think of anything more rewarding than saving a life." While the ability for even one person to communicate with the outside world immediately after a disaster has potentially huge impact, the number of people making calls from Haiti by amateur radio appears to be very small. Brian Crow, who has been communicating with people in Haiti by radio from outside Pittsburgh, Pennsylvania, said only three people in Haiti have made contact with the United States by ham radio since the earthquake. Crow said his primary role has been taking calls, finding out what aid is needed, and relaying the information to Web sites collecting news about missing people. A number of sites -- including CNN's iReport and Google -- are creating databases with information about missing people in Haiti. Other groups have put together population estimates based on satellite maps as a way for aid groups to target their relief efforts. And a site called Ushahidi is mapping text messages and calls for help in Haiti to give aid groups a better picture of dire needs for food, water and medical help. Gaillard, the Haitian man who used ham radio to contact loved ones, said the week following Haiti's earthquake has been absolute hell. But the fact that he could get on the radio and talk to people outside the situation made him feel connected to the world and has given him the strength to keep going. "We are in God's hands now," he said.